Writers use Personal Knowbase to collect and manage notes, ideas, and clippings. Gather all of your research notes, story and article ideas, and web clippings into one free-form database. Personal Knowbase makes organizing easy by using a natural way to retrieve notes, using keywords to filter your notes for related information. It's like digital index card stacks with keyword tags. Do you need to organize your notes and ideas? Save time with easy note-keeping. Reduce the paper clutter hiding your desk. Record ideas quickly without having to navigate deep data trees. Access stored information instantly just by selecting a relevant keyword or two. Handle large numbers of items as easily as a few. No limits on number or length of notes. With Personal Knowbase, you can be an information packrat. Collect any and all information for “future projects”. This Windows desktop software helps you keep the information organized so you don't drown in it. 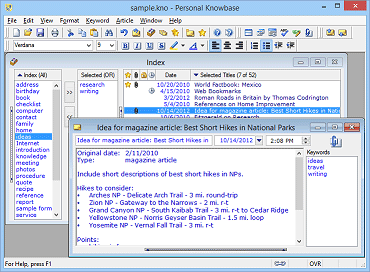 Authors, journalists, editors, bloggers, and freelance writers use Personal Knowbase to take control of their notes. For collecting story and article ideas. Leave Personal Knowbase open in the background. When an idea comes to you, get it down fast in PK, then return to what you were doing, assured that you can find the idea later when you need it. Sometimes when you're doing something else, a snippet of dialog or action runs through your head. Get it down quickly in a PK article. Then, when you later work on the corresponding scene, pull up this saved gem and incorporate it into your working draft. For managing notes. Lots of notes. Research notes and reference materials. Character and plot notes. Story leads. Interview note-taking. Details for that growing list of ongoing projects. For saving quotes and anecdotes. Save them with a few relevant keywords, and you'll always be able to find the quotation or story appropriate to your needs. For recording sources. Keep data about sources. Then link research with bibliography entries using hypertext links between records. For writing drafts. Personal Knowbase is great for getting your thoughts down in the early stages of composition. Save blocks of work with or without concern for ordering and formatting. Later, organize these blocks using keywords for the various book chapters or project sections. For business information. Save notes on markets, contacts, and Internet accounts. Freelance writing is a business, and businesses run on records. Take Control of Your Notes with Personal Knowbase Today! Doing Research for a Writing Project?